As the snowy conditions were quite bad around my neighbourhood I decide to have a day in of reading, I’ve being looking forward to reading Angela Clarke’s book for a while. (Hence the facts I can’t even remember the last time I read an actual book without it being Vogue etc.) A part from nipping to the groceries it was a quiet day in. 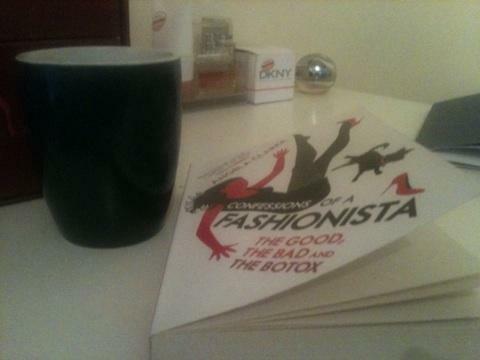 Confessions of Fashionista is a real eye open into the Fashion industry if you are an outsider however, if you aren’t then I guess it is also great to catch up on the gossip and have a giggle about our industry. The book gives young people like me a throw into the deep end as Clarke’s book starts off with her starting out in the industry at Harrods graduate training programme. There is a positive and humours side to Confessions of a Fashionista which is in regards, to learning that Editors don’t eat cake they actually sniff it hence all the calories of denial to their sample size closets. After reading the passage regarding the cake caused a moment of giggles amongst the fact fashionista’s and celebrities go to extreme lengths for their pets. (See chapter “it’s a dog life”) Dogs can actually have business class seats on planes. As the book continues Clarke reminds us that Fashion does give us something back which comes through having the reward of investing in an iconic bag. Amongst Clarke’s Mulberry moment Fashion also gives you the promotions if you work hard at your job whilst, dropping the velvet ropes into clubs and fashion shows. Whilst having a full contact book of useful people in any cases of situations. There is a romantic theme which runs through the book which involves Mr Darling and Clarke’s relationship of their life as a couple in London. I loved this running theme of Mr Darling and their relationship status and how having to mix between their busy careers. There was tensions at some points where I was like don’t break up (It became a gripping read at times) however, I was very glad when I got to the chapter ‘diamonds are forever’ that their relationship had landed on a positive. This book teachers you many things that you need to know about the industry. The models to how to fit in whilst, learning when the season’s collections come in (shop autumn/winter in august & spring/summer in February.) Along with learning that Fashion is not your credit cards best friend however, if you’re good with your money of paying your cards bill it may land you a good credit score. Whilst learning to survive the heartbreak and staying sane in a fashionable world. Confessions of a Fashionista is a must have book for anyone like myself, a romantic type, loves eating cake, likes a good giggle.. It fits into anyone’s category and it’s a good book to take anywhere with you. I would like to say a massive thank you to Angela Clarke for writing such an inspirational exposure of the world of fashion, whilst wishing you all the best as the year continues to develop. The Confessions of a Fashionista book is now available to purchase.